When Tilly was nine, she worked out how to make her food synthesizer produce only spumoni ice cream by calculating the exact protein concentration and small particle dispersion of emulsifiers required. She rated herself as the best theoretical engineer at Starfleet Academy, and was fast-tracked in order to serve aboard the Discovery. She initially had quarters of her own due to her "special needs", since she was allergic to polyester and viscoelastic polyurethane foam, which caused her to snore. She then started sharing quarters with Michael Burnham. During her time aboard the Discovery, she served in engineering. She also was part of the boarding party sent to investigate the USS Glenn. Although often socially awkward, Tilly came out of her shell in certain settings, such as the party held on Discovery; even showing aptitude in 20th century beer pong. During the event, Tilly rebuked romantic advances from Lieutenant Rhys. 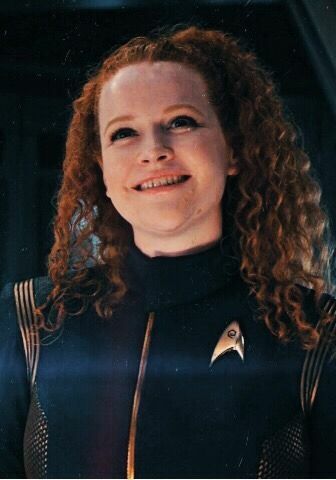 Paradoxically, Tilly also became a social mentor of sorts to Michael Burnham and facilitated her introduction to future romantic interest, Ash Tyler.